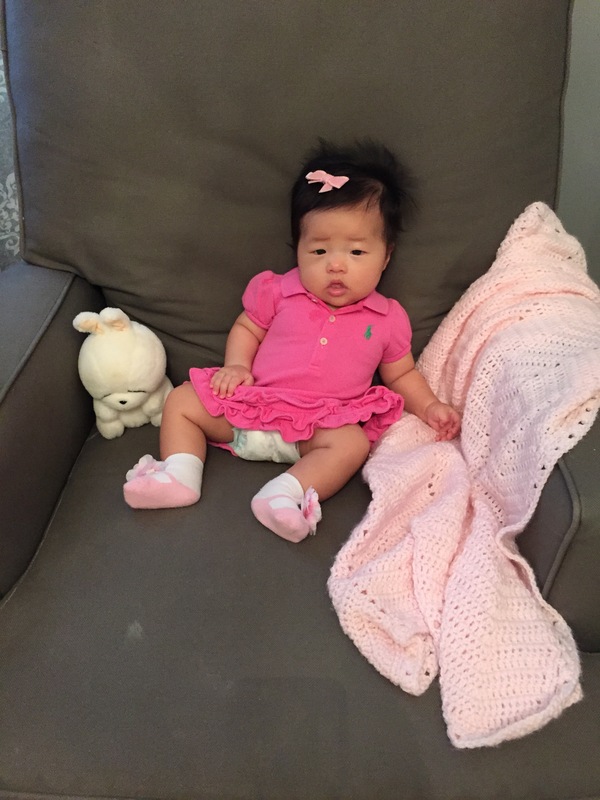 sweet p is 3 months old! it’s quite the hassle trying to get these monthly photo shoots done since i do it by myself. i do it when she wakes up so she’s not as fussy and there is less danger of her spitting up on her clothes. 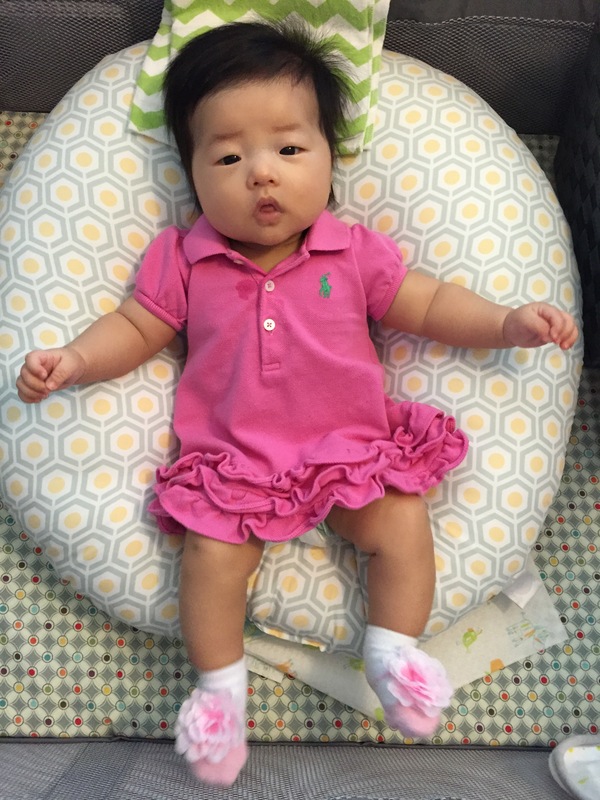 as you can see, the polo dress is already getting to be too small for her even though the size is 3 months. this was her first time wearing it too! now more than ever, she is grabbing, pulling, and pushing toys all the time now. 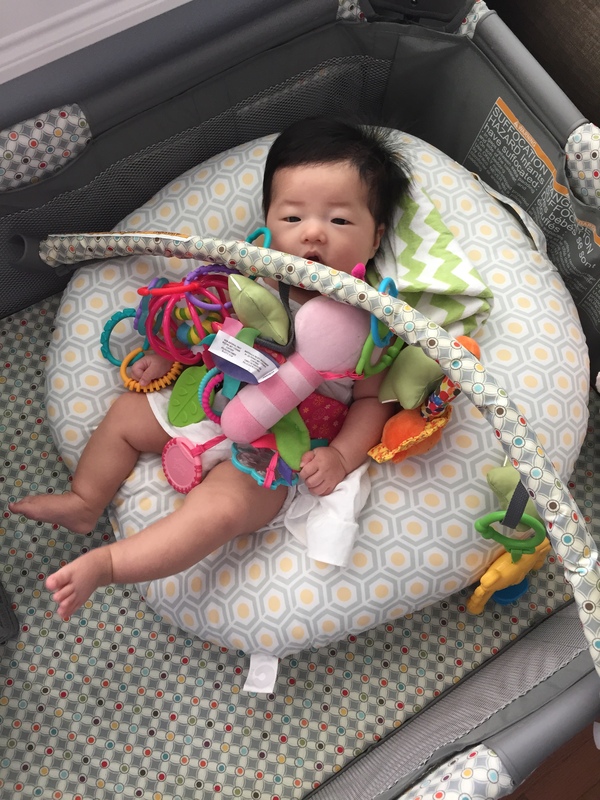 she loves to lay in the boppy lounger and play with the toys that i hang on the arch above the pack and play. i try to rotate the toys so she won’t get bored. 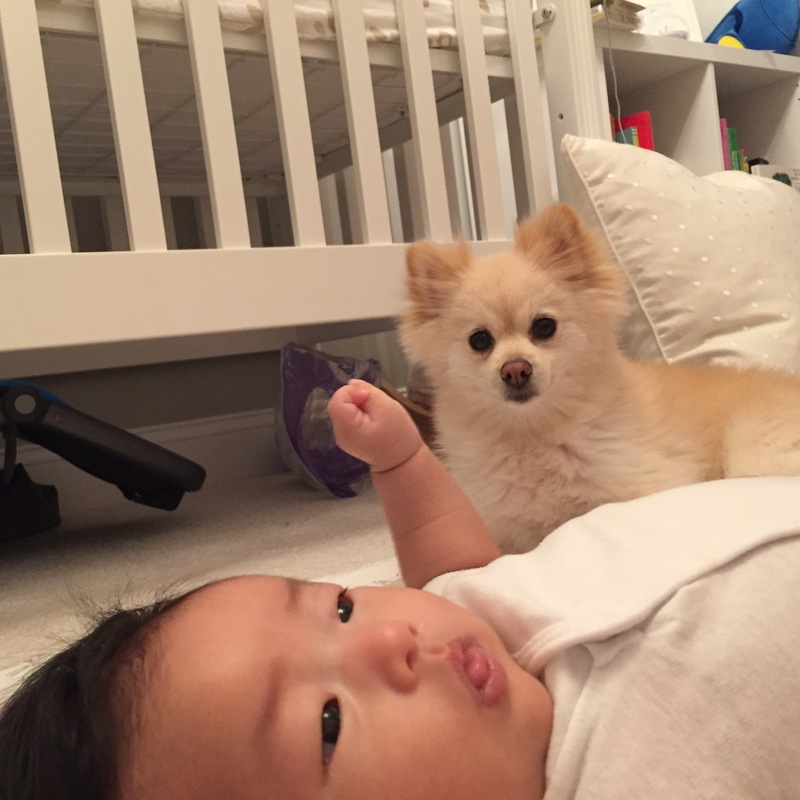 another thing i noticed is that penny is starting to put my hand in her mouth. whenever i hold penny, i usually have her in the sitting position facing outward so she can see everything. since my arm is across her chest for support, my hand is near her mouth and she leans forward to lick and nibble on it. her sensory awareness is definitely heightened and i love watching her explore, and also get entranced by different things. the other day, i looked down to check on penny and the arch had fallen on her! i probably didn’t secure it well enough and when she tugged on the toys, it fell over 😀 of course i had to take a picture first. as she becomes more aware of her surroundings, penny is also getting easily distracted during feedings. sometimes the time spent nursing is doubled because she will constantly unlatch/relatch after gazing at an object. 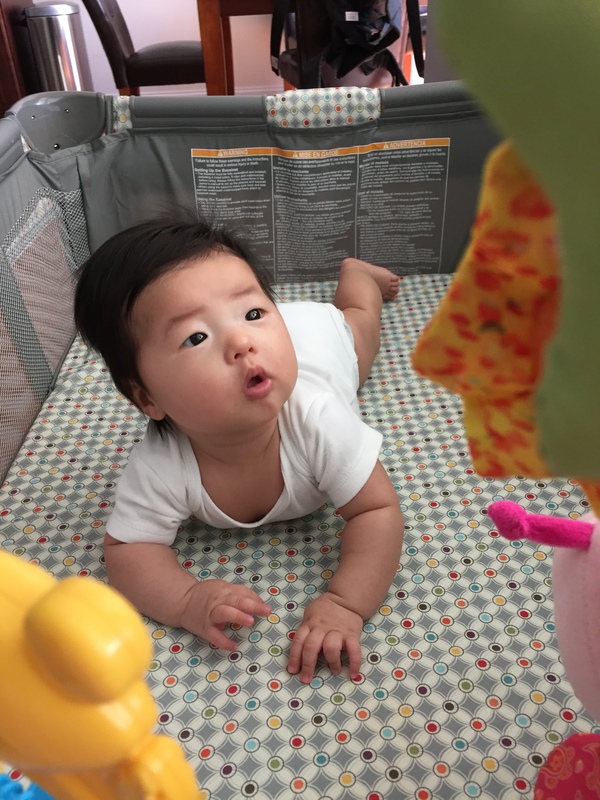 ever since she began focusing on objects, she has been staring at tall objects and anything on the ceiling such as lights and ceiling fans. i could walk by the kitchen while holding her and she will bend over backwards just to look at the pendant lights over the breakfast bar! it’s rather hilarious. since she likes looking at lights so much i turn them on and off for her. 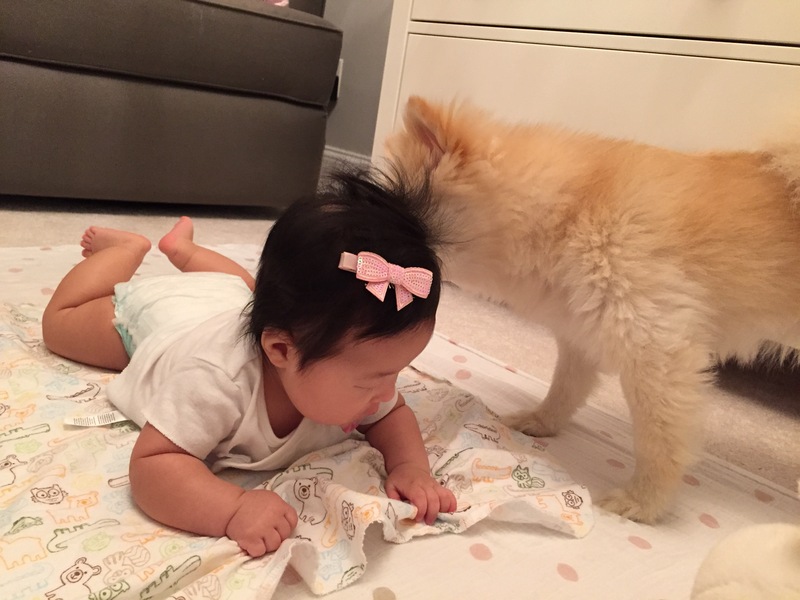 i may have mentioned in previous posts how penny dislikes doing tummy time. i have to catch her at the right time to do it. i have had penny do tummy time after a feeding (after she’s burped and played) but she still ended up spitting up a lot because of the pressure on her stomach. 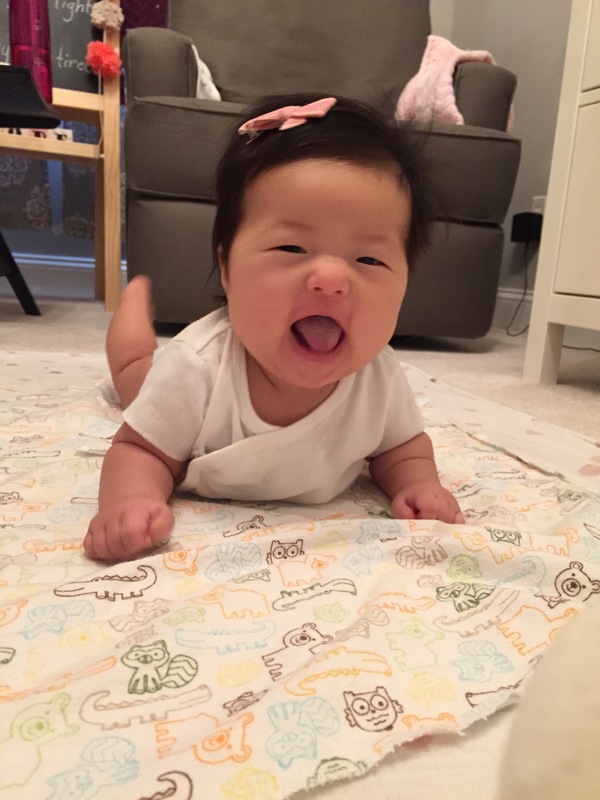 now i have her do tummy time as soon as she wakes up and it seems to be working out better. 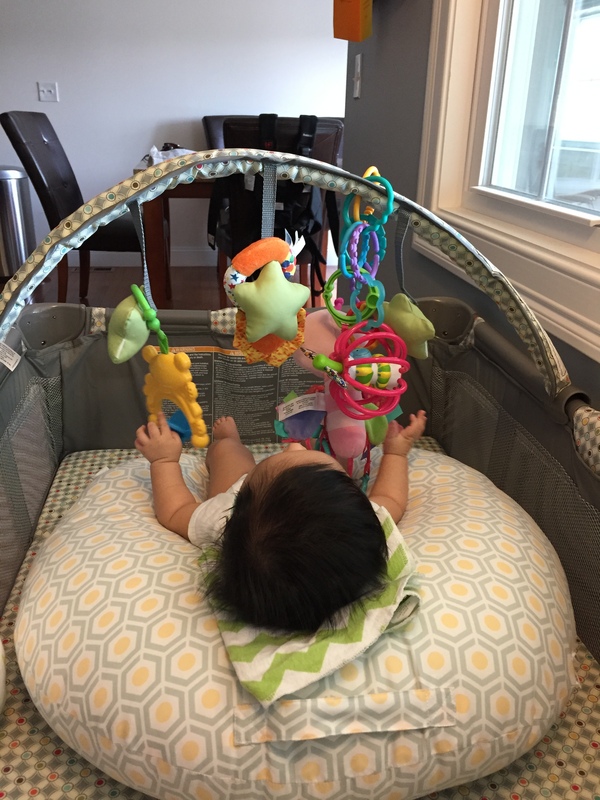 i also talk to her and encourage her to keep her motivated… having toys nearby helps too so she can focus on them. 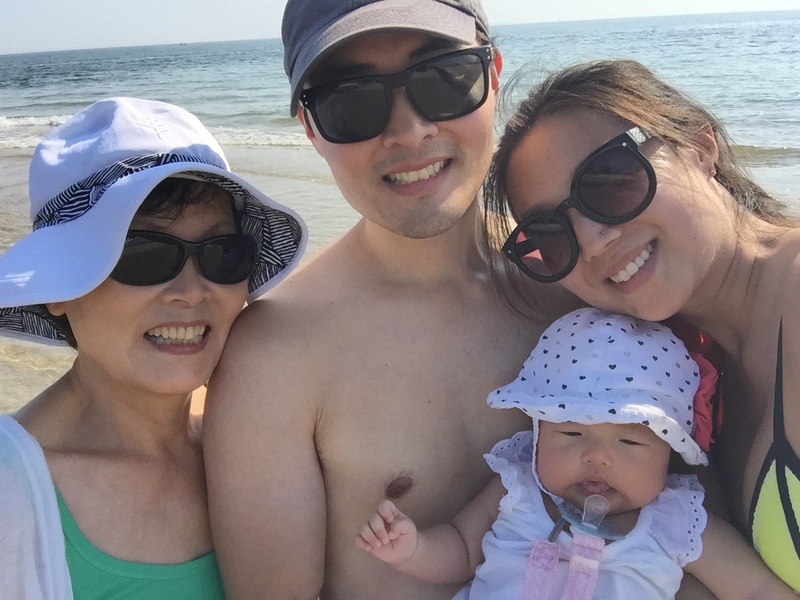 on monday, dennis and i took his mom and penny to the beach. 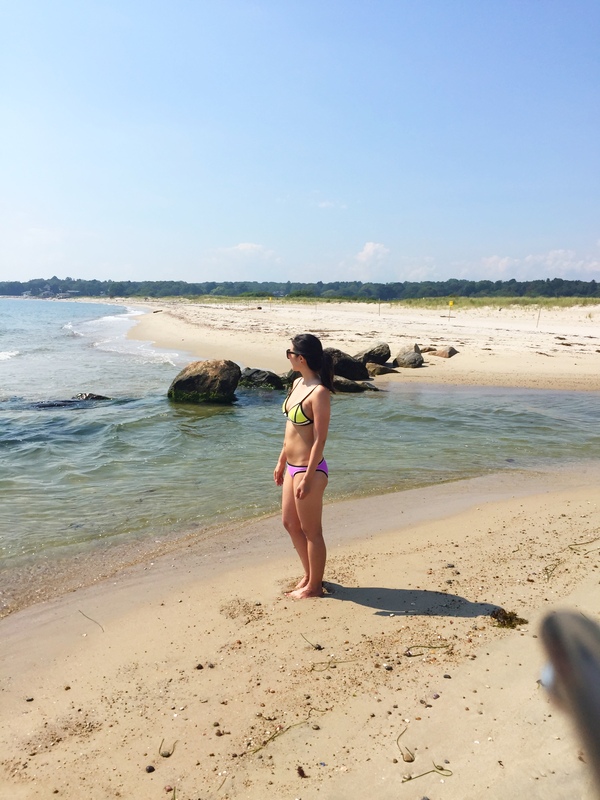 we went to harkness memorial park which has a small beach area. since it was monday, there weren’t too many people there. the downside is that swimming is not allowed probably because it’s rocky near the shore, and it looked like there was a steep drop-off. people still waded in though to cool off since it was in the 90s that day. penny has trouble napping on-the-go so i was anxious about the car ride (1 hr. 15 min. 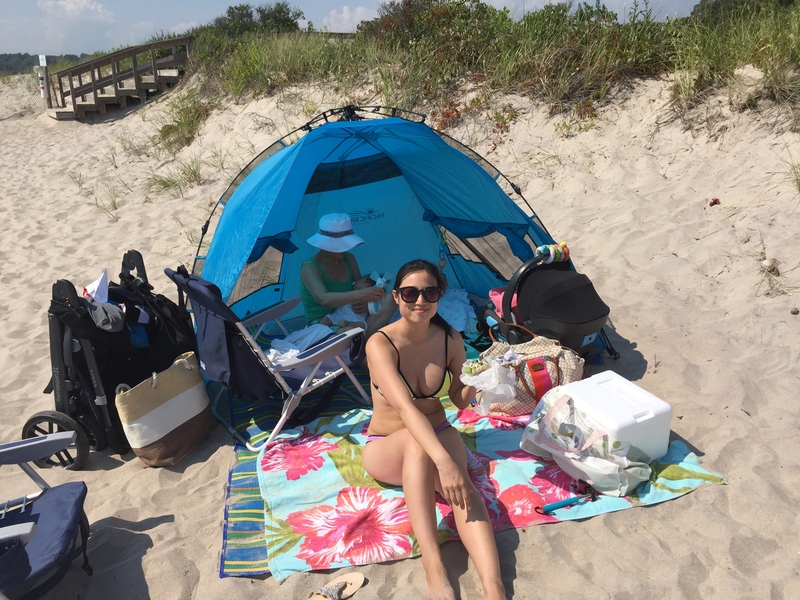 each way without traffic) and how she’d fare at the beach. since penny had been taking short naps lately, we got the car loaded and ready to go as soon as she went down for her first nap. little did we know she would nap for 3 hours! (we went to church together for the first time the day before so she still may have been tired from that.) dennis and i ended up sitting around waiting for her to wake up. maybe because of that lengthy nap, she was great during the entire trip! right when she woke up, i nursed her and we set off. dennis’ mom sat in the back with penny and kept her comfortable. she was quiet the whole day down save a few protests when we were stuck in traffic and she wanted the car to move. 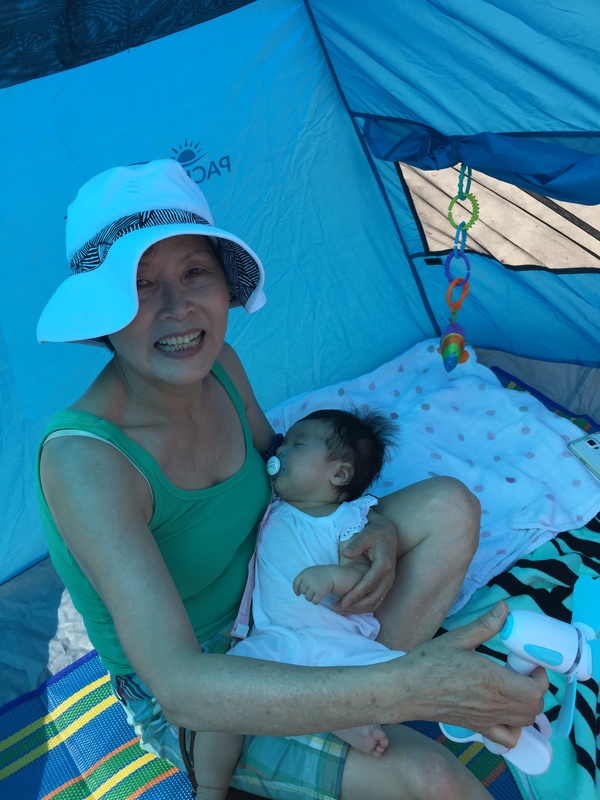 at the beach, dennis pitched a tent we had bought specifically for little p so she could stay out of the sun. 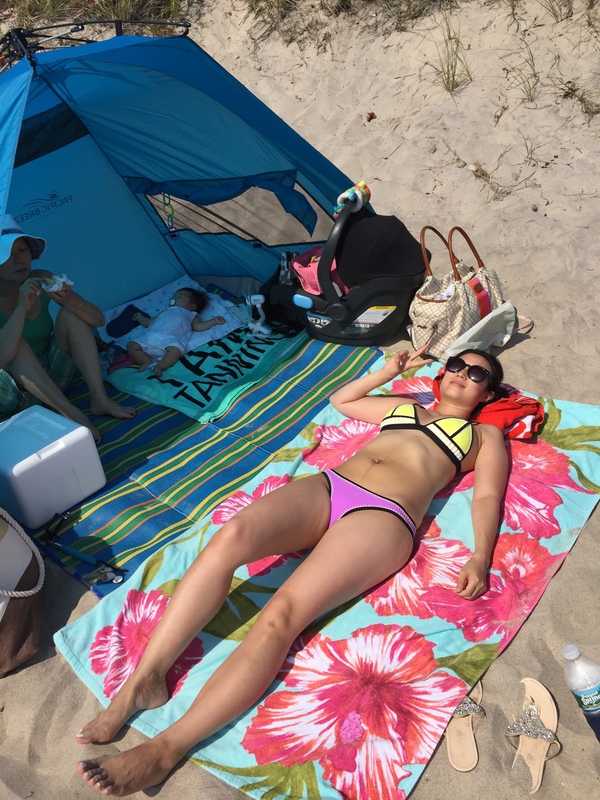 the tent also offers spf50 shade which gave us a peace of mind. 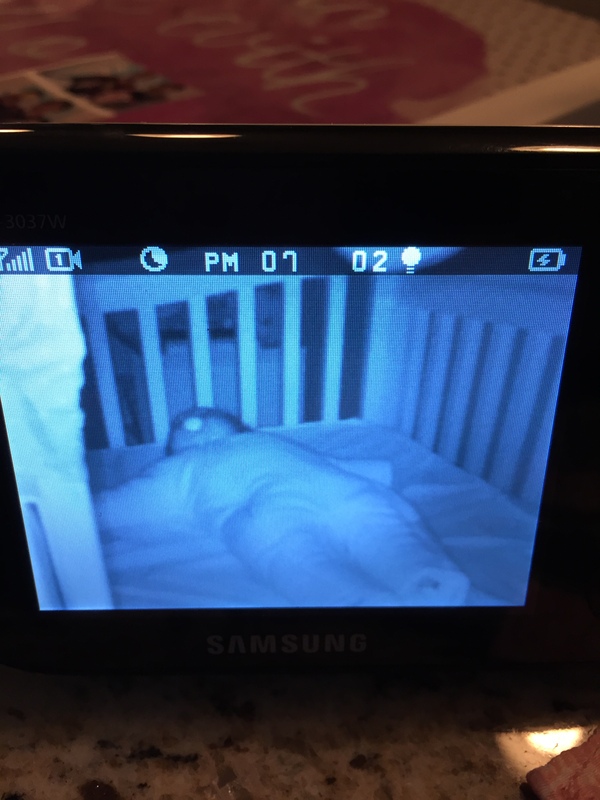 the ideal window for her naptime had passed so she started getting a little fussy. dennis’ mom cradled her and penny ended up falling asleep in her arms. she took a catnap for a half hour while we sunbathed and ate lunch. 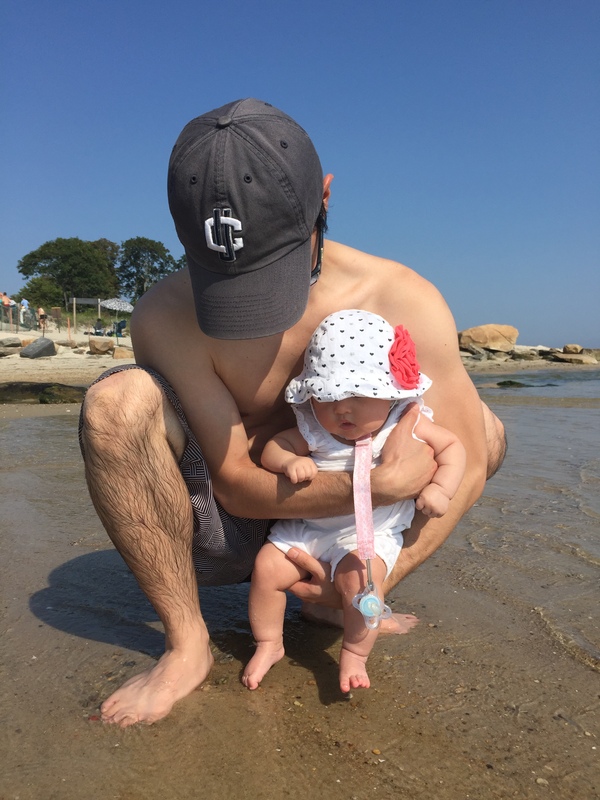 when she woke up, i nursed her and applied baby-friendly sunblock so we could all explore the beach together. whenever we try to take a family photo, penny has her mouth open.. it never fails. 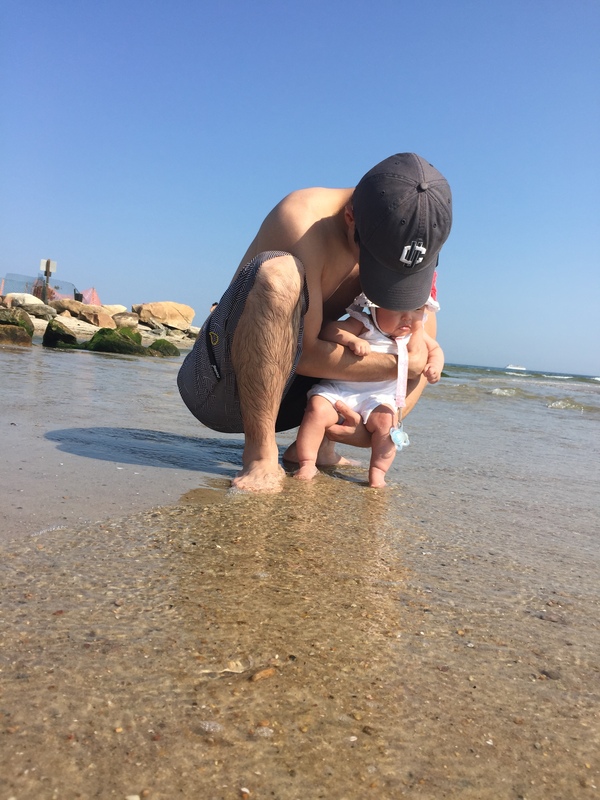 touching the ocean for the first time! look at her pout, lol! we left around 5 so we could make it back in time for penny’s bedtime. on the way we stopped to get fried clam rolls (dennis’ idea) and they were delicious. as soon as we got home, we did the bedtime routine and she was in bed by 7:40.. a little later than usual but it was also close to 6:30 by the time we got home. 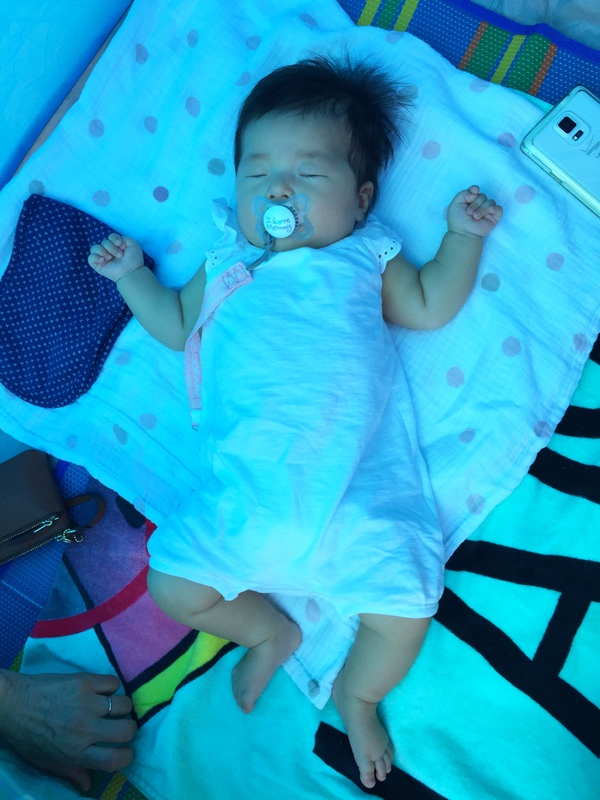 sure it’s nice to be out and about with your baby, but i believe it’s very important for babies to sleep especially if you’re trying to have them on a routine. plus, an overtired baby is not fun for anyone. if i can help it, i’m not going to be out with penny past 5 until she’s older. look how tired she was! the above picture was taken on sunday. i took penny to church for the first time and she was overwhelmed by all the attention. she came home and napped for 1.5 hours only waking because she was hungry. i nursed her on the couch and she passed out for another 1.5 hours. i didn’t dare move her so i sat there, trapped, and watched the pga championship. at least i was able to relax and watch tv.. something i never do when penny’s awake. we are trying to avoid screen time for penny until she’s, at least, 2 years old. 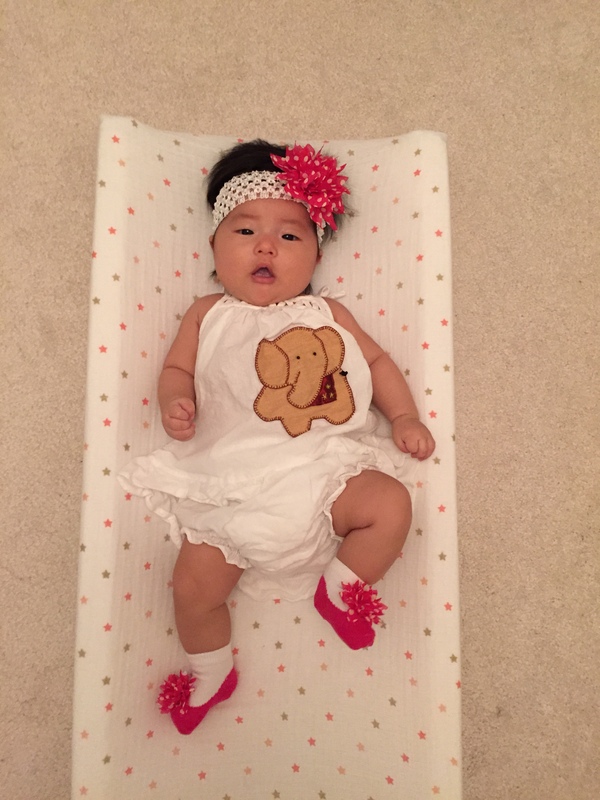 the adorable elephant dress is a gift from liz and andy when they vacationed in thailand. 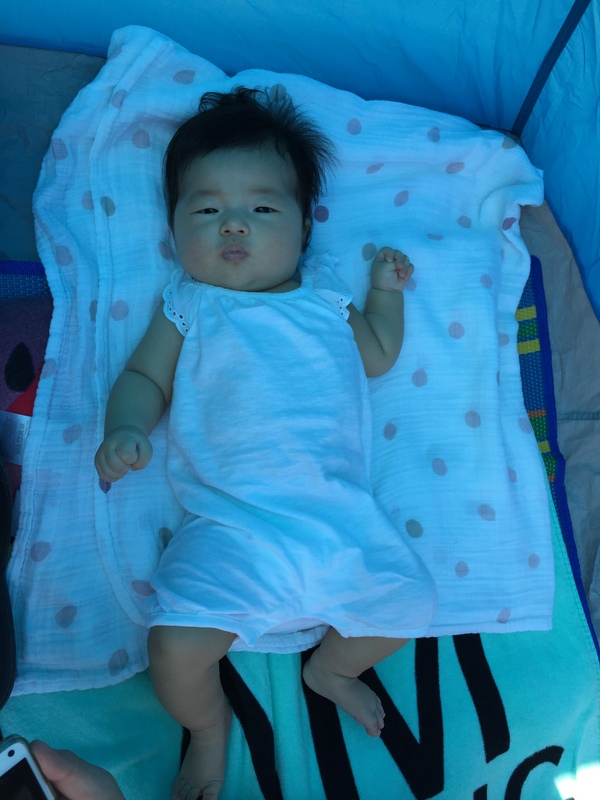 going back to the importance of sleep… penny has strong reflexes which used to awaken her from sleep too early. she would wake up crying because she was still tired and we would have to put her down again. after reading rave reviews on the magic merlin suit, we purchased one during her growth spurt. 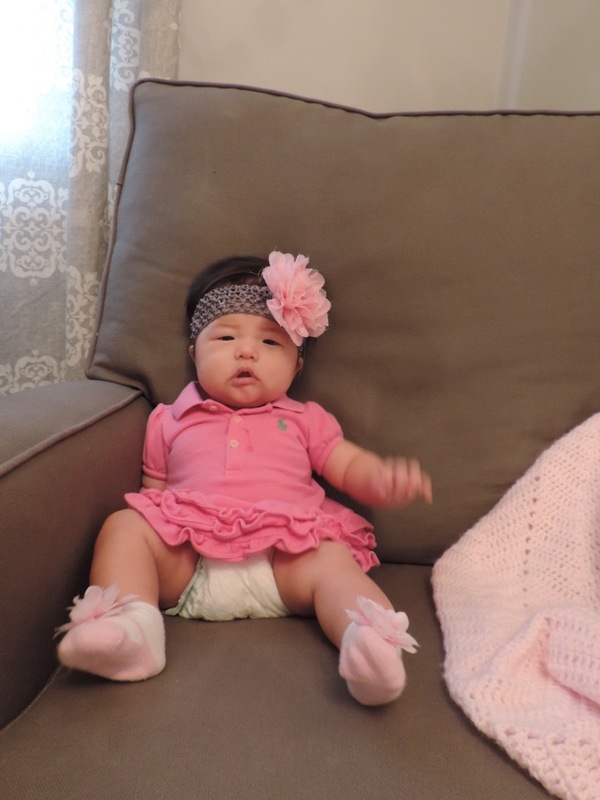 she ended up waking up every four hours because she was hungry but i don’t discredit the suit since she was going through her 12-week growth spurt. after that ended, she began sleeping 7+ hours again with the suit’s help. looking at it, it seems too bulky and warm for the baby but as long as the ac is on and your baby is wearing minimal clothing, she’ll be fine. 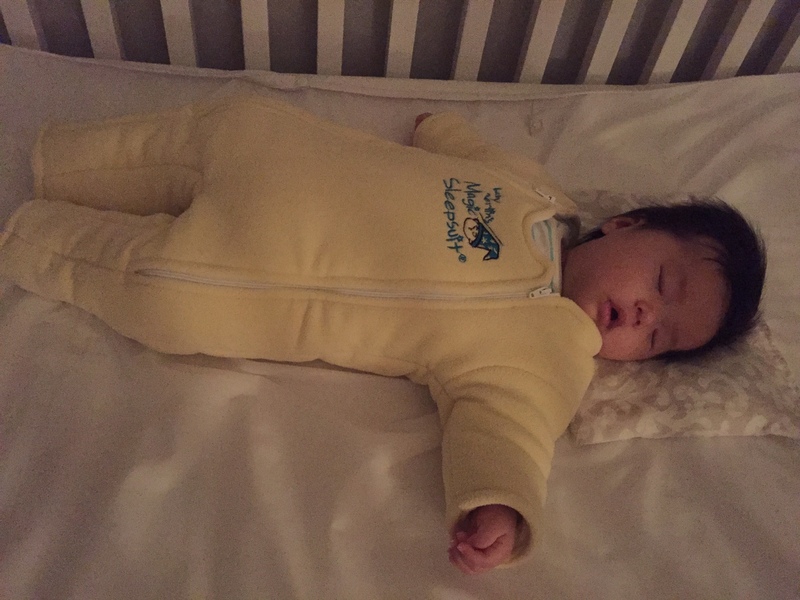 the fluffiness of the suit softens the baby’s reflexes to decrease the likelihood of her waking up. there were a few instances where penny definitely would’ve woken up because she let out soft cries and flailed her legs but the suit soothed her back to sleep. if you google image the merlin suit, you will find many adorable babies wearing what looks like a snowsuit. it makes penny look like big hero 6. 🙂 initially, she didn’t like the suit because it was hard to put her arms through the sleeves. (be careful that you don’t pull on their arms.) we guide her arms in through the sleeves using her elbows and stick our hand in through the sleeves to make more room for her arm to go through. now when we lay her on top of the suit, we give her a pacifier as we put her arms and legs inside it and zip her up. she only wears a light cotton undershirt and diapers while in the merlin suit. we also put her in it for every nap because there are days she’ll only take 30-45 minute naps. those though, i found, aren’t totally solved by the suit but at least she sleeps long stretches at night. 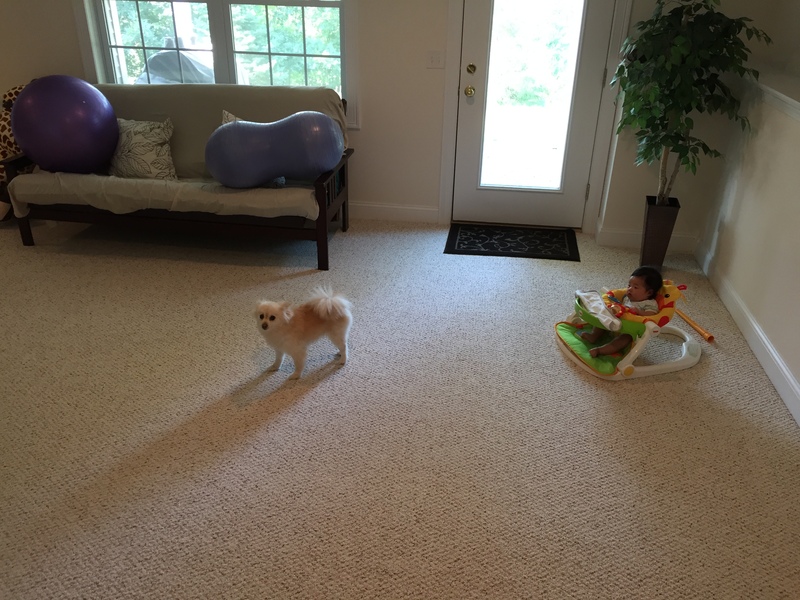 penny kept waking up so we kept her preoccupied while getting things done around the house. she loves the sounds of the vacuum, washer/dryer, and the blow dryer. 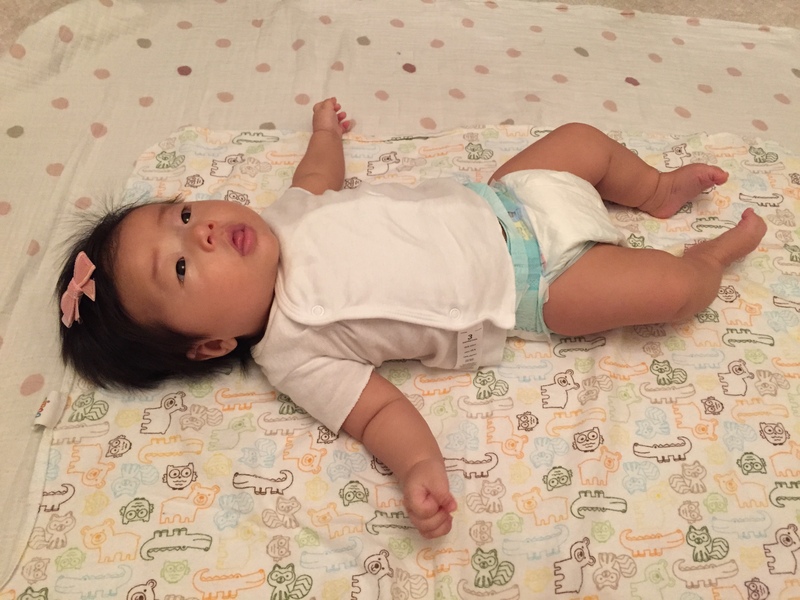 Love your Boppy pillow! So cute!